There is an article, "D.C. Metro's New App May Need a Pre-Launch Update," on CityLab, about WMATA's forthcoming phone-based payment system, and the author makes the point that by "merely transporting" the current card-based SmarTrip contactless fare payment and stored value system to an e-commerce app, it may be less innovative because it's not likely to include payment capabilities for modes not currently part of the payment system. This is an interesting point that's been a concern for a long time, dating to c. 2001, triggered by the launch of (for profit) car sharing, followed by dock-based bike share a few years later. Sustainable mobility platform/TaaS and MaaS. 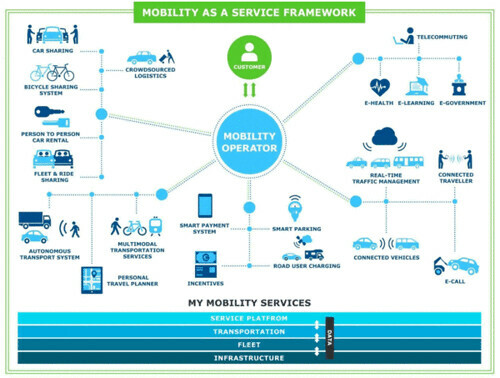 As the types of mobility (modes) available become broader and more diffuse, and the discussions of what I call the sustainable mobility platform but in the trade is referred to as transportation as a service/mobility as a service (TaaS/MaaS) it's deserving of more attention, as it raises some interesting issues. Unless the IT and access systems are designed from the outset to be compatible, it's difficult to have an integrated fare card that works on local transit as well as car sharing and/or bike sharing. But I am not sure that is as big an issue as I thought, because there are various standards systems that ensure access and interoperability. 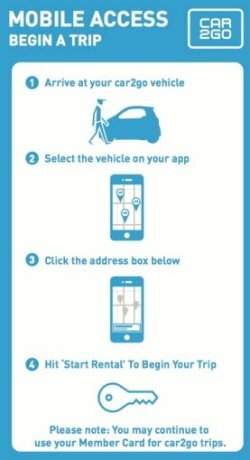 More importantly, more mobility providers, including the car sharing firm Car2Go and all the new dockless bike and scooter providers, don't use card-based access systems, doing everything through phone-based applications. Plus, firms operating programs on a multi-city footprint probably see it as a waste of time to integrate payment systems into local fare media programs when people are paying directly through their apps, linked to a credit/debit card or bank account. Finland Ministry of Transport and Communications graphic. Regional transit fare payment systems. With a few exceptions, like Greater New York City, by now most major metropolitan areas with multiple transit agencies have developed an integrated fare card system. Examples include SmarTrip in DC, the Oyster Card in London (the first major example actually), the Orca Card in the Puget Sound region, etc. 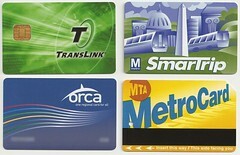 where it is set up as a master fare card that works across transit agencies in a defined region. At the time, it was a great accomplishment for transit agencies to pull this off. Because most metros have a primary transit agency and a number of secondary systems, usually the primary transit agency takes the lead on creating a fare card payment system for its own use, and then opens up the platform to other agencies. In some areas like San Francisco, the lead was taken by the area transportation planning agency. Aren't necessarily usable on all forms of local transit. But most of these fare collection systems don't cover every service. In most places, railroad commuter trains aren't included. For example, in the DC and Baltimore region, while the SmarTrip card works in Baltimore and the CharmCard works in DC (actually the CharmCard is merely a branded SmarTrip card), it only works on bus and subway in the DC area, and bus, subway and light rail in Baltimore. It doesn't work on railroad commuter services. AND (which is a massive failure), SmarTrip cards can't be used on the bus between Dulles Airport and the Wiehle-Reston Metrorail station, even though the service is run by the Metropolitan Washington Airports Authority, a public agency. By contrast in both the San Francisco and Puget Sound regions, the fare card systems work on railroad trips, as well as ferries. In other places, railroad passes may provide free access to certain local transit services. That is the case with MARC railroad monthly passes, and the Metrolink system in Greater Los Angeles. Access to nonprofit mobility services that aren't traditional transit: bike sharing/car sharing. With a couple exceptions, mostly in Montreal, access to car sharing and bike sharing hasn't been integrated in contactless fare media systems. 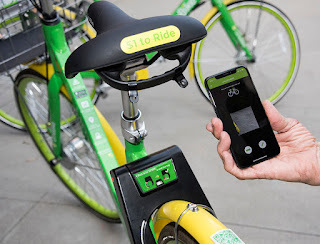 The bike sharing program in LA has been integrated into the TAP card system for access, but payment is separate from the stored value system used for transit. The major exception is Montreal's STM transit system, where the Opus card can be used to access Bixi stations as well as card readers for cars in the Communauto car sharing program. I think the difference is that both are local systems and the transit agency saw the value in integration. What happens when for profit businesses enter the mix? The problem with the thesis of the CityLab article is that for profit businesses engaged in transportation--car sharing, dockless bike and scooter sharing, taxis, etc.--may not be interested in participating in local transit fare media systems, especially when they operate on a national scale. A dockless bike share bike from Lime Bike. They're likely to see the cost of developing software integration applications for dozens of different transit fare collection systems as being greater than the benefit. Similarly, they're not likely willing to pay collection and transfer fees, which are likely to be significant. 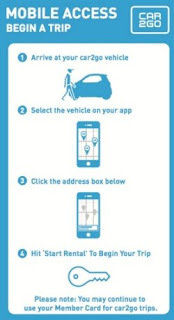 For them it's a lot easier for you to just use their phone-based app. How to integrate for profit transportation service providers into the planning and operations mix? Regular readers know that in places like the DC area, with a balkanized set of transit agencies, I advocate the creation of collaborations equivalent to the "transport associations" of Germany. These pan-metropolitan organizations integrate planning and operations into one body, provide integrated services and fare collection systems, regardless of what agency provides the service. Note that Transport for London and the transit agencies in Greater Paris operate similarly. But how do you integrate for profit entities into the mix? Many transit agencies are working with ride hailing programs like Uber and Lyft on "microtransit" services. Mostly, dockless systems have been more a matter of being foisted on local communities. Theoretically, from a planning and operations standpoint, if the planning and transit operations paradigm was shifted to the German transport association model, it would be possible to bring the for profit sustainable mobility providers to the table. I'd argue that the licensing regime for new mobility services should require participation in a metropolitan transport association coordinating and planning body. But the problem is multi-fold. 1. Most places don't have transport associations even though they have required transportation planning organizations--transport associations integrate planning and operations. 2. The planning systems that exist aren't set up to deal very well with non-government entities. 3. The planning systems are often jurisdiction specific and don't function well at the metropolitan scale. This is a problem even for government provided services like bike share that aren't transit. 4. For profit entities are competitive market-based organizations out to maximize their success and economic returns at the expense of others, without regard to the impact on parts of or the whole of the sustainable mobility platform. Parking and tolling as another example. Like traditional bike share, even though public parking and tolling systems are run by public agencies, their payment systems aren't integrated into one master fare, mobility access, and payment system. I did see an article a few years ago that a tolling organization in Texas proposed moving towards that kind of system. EZ Pass is an interesting model because it operates on a multi-state scale covering dozens of metropolitan areas. Would it make a lot of difference if transit media fare payment systems operated on a comparable basis, beyond that of even a metropolitan area? Information versus payment. Because most people are comfortable using debit card based payment systems, I no longer think that integrated payment systems with transit fare cards as the base are that important. The key with the sustainable mobility platform/TaaS/MaaS is integrating the modes at least in terms of information and awareness. Yes, there is "consumer pain" at the outset of creating an account for a particular service, but after that initial touchpoint, access and payment isn't much of an issue. 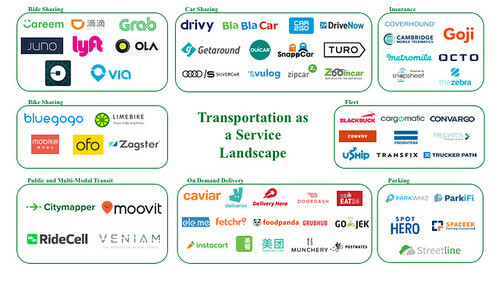 Image from "The Road to Transportation-As-A-Service," Nokia Growth Partners. I forgot to mention that Ontario developed the Presto fare card system, I think originally for Greater Toronto but then has made it available to all the other transit agencies across the Province (although I don't think Ottawa participates). So it's the same card, and will take your money, but you'd have to add system specific pass products separately.